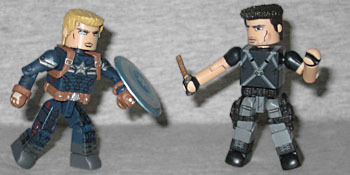 After the Battle of New York, Steve Rogers is put to work as an Agent of S.H.I.E.L.D., reacting to crises around the globe in a newer, less colorful uniform. How good was Steve Rogers' back-to-life costume? Not only did the comics find a way to save it when he went back to his old uniform, but it also got adapted almost immediately to the movies. This Minimate is painted with a ton of complex details on the chest and legs, though it's awfully hard to see tiny black lines against navy blue. His star and stripes are silver, and he's got brown gloves (with patches of skin showing through on his hands and knuckles), belt and shoulder-straps. His sealth shield is the same mold as previous ones, just painted blue, and he has hair if you want to take his mask off. And he'll be even more fearsome when he becomes Crossbones. 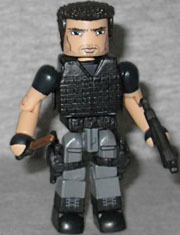 Agent Rumlow was played by Frank Grillo, and the Minimate's likeness is a nice approximation of the man. His costume isn't very colorful, just black and grey, though he does have a nice vest. 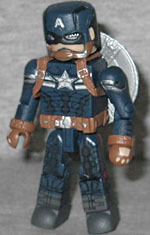 If you take it off, you can see the straps across his chest that were Winter Soldier's sole nod to his comic costume. He's armed with two pistols that fit in his holsters, an HK94A, and a weird little stick - good thing the bio reminded us that he uses a shock baton, or I might never have remembered what that was supposed to be.